Ambitious promises, mostly go unfulfilled. 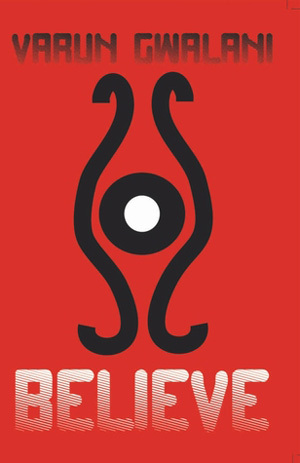 Believe is Varun Gwalni’s first book, he is an 18 year-old from Mumbai, India. And it is a delight to see that it’s not a love story. Conner White is the author of some very depressing books; the books even lead someone to commit suicide. Combined with the stress of criticism from a random girl he met at a bar and devastation of his wife’s death, he ends up in the town of Levion. Levion is an interesting town, the people in the town follow a religion called Natism, worshipers of Natis (the cover has the eye symbol which represents Natis). And a strange fatal disease, Levitis, affects people randomly, it’s symptoms keep changing. Levittes, the residents of Levion, don’t leave the town to keep it from spreading and all words about this disease is kept hush-hush. There, Conner meets Victoria, the good girl character, she is a little strange for the townsfolk and plans to run away. Together, they save their own selves and the town of Levion from an ancient conspiracy. The basic premise of the story is very unconvincing, and so are most the motivations throughout. Being a, supposedly, popular author; why was did the words of one person hit him? Even after two chapters of convincing the reader about the misery of Conner White; it doesn’t feel real. The novel is set in a different world, which has no defined parameters. And there is not enough consistency or logic behind how this world functions. The portrayal of a parallel world requires more mastery than writing about the reality; which the book doesn’t have. The writing style is full of adverbs and random adjectives, which make it very distracting. Mostly an over attempt to explain a situation. I don’t think any girl would use those words to describe such a thing. Especially Victoria; it doesn’t fit the character. The stereotypical names of people is slightly corny: Conner White, Megan White, Dr Clark, Victoria etc. Conner slowly extended his hand, put it below Victoria’s chin and raised her head till her eyes were staring into his. It’s not a love story! It’s a relief to see some different writing coming out than social-media driven love stories. Some good thought to the topics that one could talk about. Varun’s narrative style his very cinematic and can often create a visual spell. That’s probably the only reason I could read the book. The only problem is, as I mentioned before, that the filmy-ness slips into the story and then it doesn’t work. The only footnote in the book is worth mentioning. Well won’t spoil it but it cracked me up. An ambitions attempt with distracting writing and unconvincing plot and narrative. Mostly fails because of lack of consistency and substance. Though the narrative style and different themes might just work for you. PS: The book is beautifully typeset. The cover concept is nice but looks armature. Published on November 21, 2013. Updated on December 27, 2013.